This year we enjoyed a bounty of raspberries and blueberries. After making raspberry jam, I had to come up with something new to use up some more. I found this recipe on Facebook and modified it to make it a little more friendly for my family. Besides, who doesn't enjoy warm cake! You could use all blueberries, but I tossed in a handful of raspberries that I froze for just a bit just for tartness and to add some red. Allow butter to soften and come to room temperature. Allow eggs to warm up as well or run under warm water and then allow to sit for a few minutes. Sift the flours, baking powder and salt together. Add lemon zest to flour mixture. Stir blueberries and raspberries into flour mixture. With a spatula or wooden spoon, gently stir in blueberry/raspberry mixture into butter/sugar mixture. Stir in milk until just combined. Do not overmix. If you use some raspberries, don't fret if they squish a little. This batter is thick and will look like you've done something wrong. You haven't...just keep going. 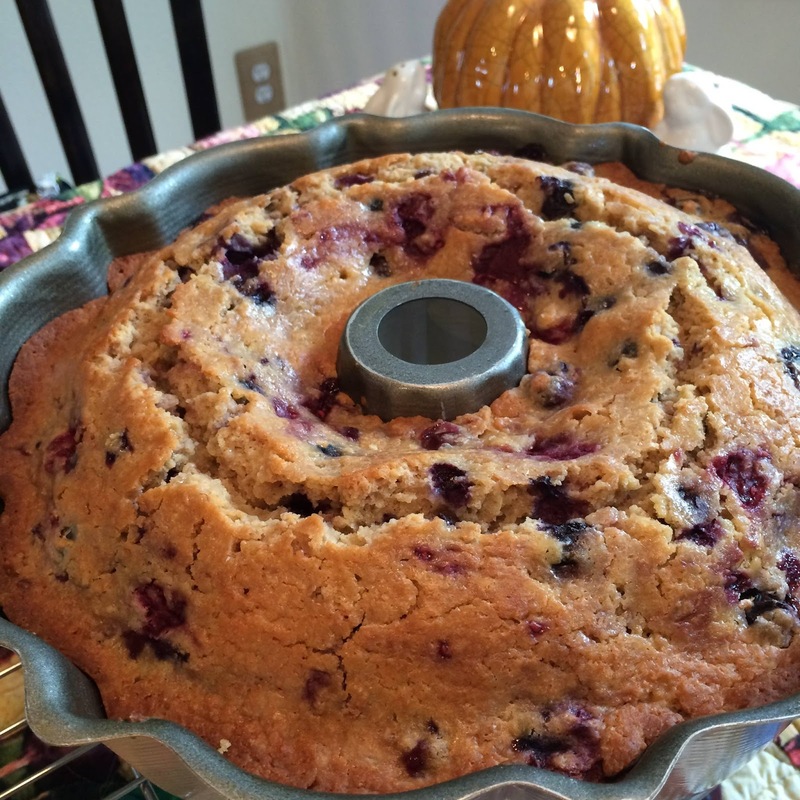 Generously spray bundt pan with canola cooking spray. Spoon mixture into bundt pan. You will need to spoon batter into each area. This batter doesn't spread so just keep spooning it into pan until all batter is in pan. Now use the back of your spoon and smooth out the top. Sprinkle superfine cane sugar on top of batter and place in oven for 60 to 75 minutes or until toothpick inserted near center comes out clean. Cool on wire rack for 15 minutes. Loosen cake from edge of pan with a thin flat spatula. Remove cake from pan. Cool completely if you can wait that long. If you can't wait, be careful biting into those hot berries. They burned my mouth but that didn't stop me! Note: I made a little bit of lemon icing and drizzled it across the top while the cake was hot just for a little more lemony flavor. You don't need it but is another alternative should you choose.